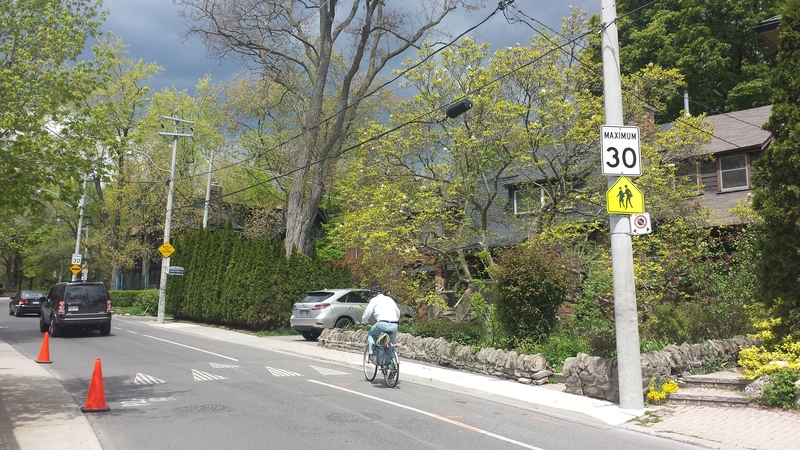 The City of Toronto’s 30km/hr Speed Limit Policy applies to local and collector roads. You can apply for a 30km/h Speed Limit on a single street or for several streets around your school. Not sure what kind of road you have? Read our road classification definitions, or search for streets by name, map or ward on the City of Toronto’s website. To have lower speed limits implemented, a number of ʻwarrantsʼ will need to be met. Warrants are criteria that a policy must pass to be recommended for approval. They can include technical requirements such as block length, speed of traffic, or the proximity to a school or park. They can also be measures of neighbourhood support, such as a community petition, a poll, or a public meeting. Warrants are assessed by City staff who will prepare a report for the appropriate Community Council, if the warrants are met. For a 30km/hr speed limit, after speaking with your Councillor you will be asked to complete a petition as required by Warrant “A.” After the petition is complete, Transportation Services will undertake a study to determine if the street meets the other requirements. The street must either meet warrants B and C or B and D.
Source: Adapted from City of Toronto (2015). Appendix A. Proposed 30km/h Speed Limit Policy. *The proposal must also not have significant impacts on transit service. A good petition needs to be reasonable, relevant and clear. It should be laid out in a way that the residents who are signing can easily understand what you are saying. You can use and/or modify the petition template in our Toolkit. Include the name of the street in question, and make sure that those signing the petition reside on that street. Include your vision for the street and the measures you are considering. When residents sign the petition they should include their name, address, signature, and date. Include the contact information of the person carrying out the petition. In addition to the mandated petition required for the 30km/h Speed Limit Policy and the Traffic Calming Policy, collecting signatures and letters of support from parents, nearby residents, and the school principal can make your case stronger. Our Toolkit also includes a sample letter of support.